In England, boats in the Norfolk Broads, East Anglia, erode the banks and suspend bottom sediment, killing submerged plants which a century ago kept the water clean and prevented erosion. "Aquatic plants not only reinforce the strength of the submerged bank material through their root system but they also help reduce fluid forces acting on the bank by increasing the frictional resistance) (Payne & Hey p.11). "Records from the early 20th century tell of fish visible amongst the weeds and water lilies in most of the Broads and rivers in depths up to 1-2 metres. Today  much of the previously abundant macrophyte population is absent or restricted and visibility is limited to a few centimeters in most cases" (Payne & Hey p.13). The Broads are shallow lakes "resulting from the flooding of medieval peat diggings after a rise in sea level during the 14th and 15th centuries" (Garrad & Hey p. 290). Payne & Hey (p.3) used Ordnance Survey maps to compare river widths from 1883 to 1976. At 18 points the river became 5cm wider per year on average from the slight erosion during 1883-1946, but then grew 21cm wider per year from 1946-76, with many more and faster boats. Speed limits were gradually imposed on more and more of the rivers, until by 1979 all rivers had a 7mph limit. This meant boat rental yards could adjust the motors not to exceed 7 mph, which "has had a significant effect in reducing the number of craft found exceeding maximum speed limits" (Payne & Hey p. 5). The study counts boat traffic at various points on two August days in 1976, but this is not representative enough to say how many boat passages per year contribute to the measured erosion. 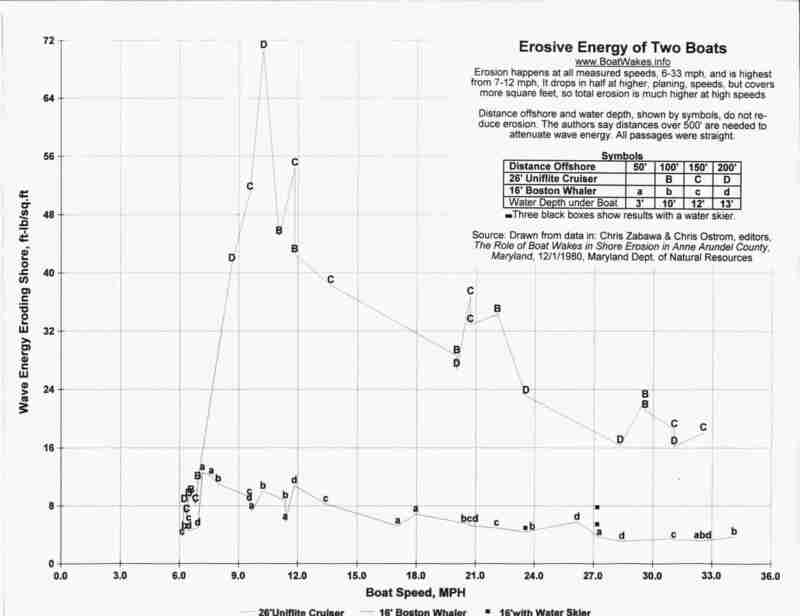 Garrad & Hey experimented with 7 types of boats at speeds below 7mph (3.1 m/sec). Each boat had a threshold speed where it began to stir up bottom sediments. Even the best designed boat stirred up sediment at 4.6 mph, and 4 of the 7 stirred up sediment at less than 2 mph (see graph). The study did not determine whether sediment was coming from the bottom or sides of the channel, and did not say the depth of the channel. It also did not say the depth or weight of the boats, though those specifications could be obtained from the manufacturers. Garrad & Hey also measured suspended sediment each hour for two days at four sites. Two sites where boats were not allowed had little variation from hour to hour. Two sites where boats were allowed had peaks of suspended sediment each afternoon, which the authors attribute to boats. The site with more boat traffic had higher peaks in the afternoons. So they recommended more control of boat wakes. Virginia did a study in 1976 of erosion on the Chesapeake Bay shorelines in Virginia. Like England, they compared old maps with newer ones, and found on average shores retreating at 9 inches per year (.73 feet or 23 cm). This is even more than the 10cm (4 inch) per year average in England from 1883-1976. While the English study measured change up to 1946, and then to 1976, the Virginia study primarily measured change up to 1942, so they cannot tell if erosion increased after speedboats became more common, as happened in England. The average erosion ranged as high as 18 inches per year in Accomack County on the eastern shore of the Chesapeake Bay (p.10 and table). Among the causes of erosion, the authors discussed waves caused by wind and the rise in sea level relative to the land, which they put at .01 feet per year (p. 2). The Baltimore tide gauge confirms an average rise of .01 feet per year from 1903-2005 (3.1mm/yr, spreadsheet, from PSMSL data). The authors provide the height of each eroded area, and the total area and volume eroded, so the average height of shores can be calculated at 7.9 feet (p.5 and table; there are many cliffs). With such substantial shores, the .01 foot annual rise in sea level does not explain the .73 average retreat of the shoreline. Even at a gentle 5% slope, .01 foot rise creates only .20 foot retreat, leaving most of the retreat caused by waves or wakes. The authors did not discuss boat wakes as a cause of erosion. While wakes may or may not have been significant before 1942 there is now substantial traffic of small boats throughout the Chesapeake Bay, and of large ships going to the Port of Baltimore and Hampton Roads. It is puzzling that p.3 says the newer maps they used were from the 1950s, while the actual list of maps on p.12 shows 92 out of 115 were dated 1941 or 1942. These were done by the US Geological Survey (p.3). The older maps were done by the Coast & Geodetic Survey (p.3) and most were dated from 1849-1868 (88 out of 115, p.12). A surprising number, 20, were dated in 1862, then none until 1868 (p.12). It is questionable whether a US agency was doing accurate surveys of Virginia shorelines in 1862, since Virginia seceded in April 1861. It is easy to see why maps of a hostile shore would be done in wartime, but their accuracy would not be comparable to maps done in peacetime. On the other hand if these maps were printed in 1862 from surveys done earlier, one wonders why a nation at war would print maps the enemy could use. The authors use the number of years between maps to calculate erosion per year, so the actual dates of survey matter, and the authors do not discuss why so many were dated in war time. Shoreline Erosion in Tidewater Virginia, by Robert. J. Byrne, and Gary. L. Anderson, 1976, Virginia Institute of Marine Science (VIMS), Chesapeake Research Consortium Report No. 8, Special Report in Applied Marine Science and Ocean Engineering (SRAMSOE) No. 111. A study of the impact of boating on Loch Lomond, Scotland mentioned wave action causing erosion and cloudiness, as well as noise and presence of boats harming birds by driving them from their nests, tiring them and increasing predation. They cite studies where increased boating led to less wildlife. Reports on Venice, Italy note damage to foundations of historic buildings, even though canals are stone-lined. Boat wakes shift the stones and cause erosion of the soft ground behind them. The Conservancy of SW Florida makes the point that Jet-Skis & other personal watercraft go fast in much shallower water than other boats, so they disturb nests on shorelines more. They say therefore virtually all National Wildlife Refuges and National Parks ban them (1999). They also note the oil pollution from older versions with 2-stroke engines. Dahlgren & Korschgren (1992) have an annotated bibliography of the effect of boats on waterfowl. "Many runabouts and larger fishing craft create a wake approximately 10 inches high when they are on plane, while large displacement hulls (cruisers and houseboats) can create a wake about 25 inches high or more. Hydrologists estimate a wake 10 inches high is five times as destructive to the shoreline as a 5-inch wake, while the wake that is 25 inches high has a destructive potential that is 30 times greater." CEDS cites Maryland's Zabawa & Ostrom study, summarized here, and emphasizes that a distance 500 feet offshore is needed to attenuate wave energies, and that in depths under 13 feet, the maximum wake effects happen at 8-11 mph, so a small excess in a 6 mph zone causes maximum damage. Torpedo Bay in Auckland, New Zealand, has much more wave action from wakes than from wind (Osborne & Boak, 1999). Ruby Lake National Wildlife refuge had to protect shores from boating erosion.